A French drain (also known as a weeping tile, drain tile, perimeter drain or sub-surface drain) is a common solution for waterproofing a basement. It's a trench containing a perforated pipe that redirects surface water and groundwater away from the foundation. This type of drainage system can be an effective way to redirect water, but it also has several disadvantages. A French drain is typically installed after a home is built in response to a wet basement problem. This requires digging around the foundation of the home. Any landscaping, such as shrubs and flower beds, as well as walkways, steps, decks and porches that are outside the home must be removed. Buried gas and water lines, sewer pipes and electrical wires could pose hazards during digging. A major problem with a French drain is that the pipe often collects silt, sediment and other debris and clogs, causing water to overflow or backup and flood the basement. 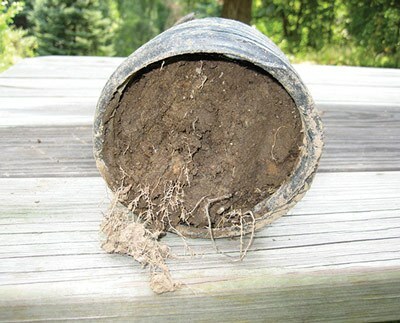 It's not unlikely for an exterior footing drain to be packed with dirt or filled with tree roots. Removing clogs from the pipe is an expensive job that requires digging. We have also found drains that were crushed due to the backfilling process. After a French drain is installed or serviced, the soil against the foundation can settle and will need to be re-graded. After about 10 years, you might need to repeat the entire process. Drag the arrows left and right to see a clogged drain tile vs the clog-free WaterGuard drainage pipe. Basement Systems' patented basement drainage systems, such as WaterGuard®, are similar to a French drain, however, our drain pipe systems are engineered specifically to solve basement water problems, without worry of clogging from soils under the floor. Unlike an exterior French drain that's installed outside the foundation in the “mud zone” and easily clogs with mud, silt and other debris, our interior drainage systems won’t clog because they are installed in the “clear water zone” above the footing. 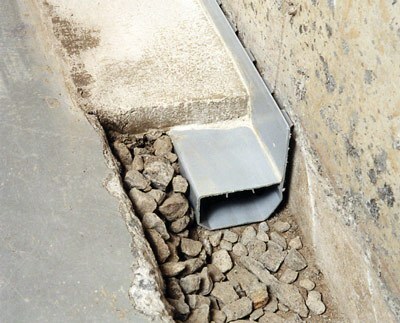 The WaterGuard® drain pipe stops water at the perimeter of your basement and safely drains it away. Installing WaterGuard® or any of our other interior drainage systems, is your first line of defense in keeping your basement dry and clean. Contact us to schedule a basement waterproofing consultation with your local Basement Systems dealer, and learn more about installing a perimeter drainage system and other basement waterproofing solutions in your home.